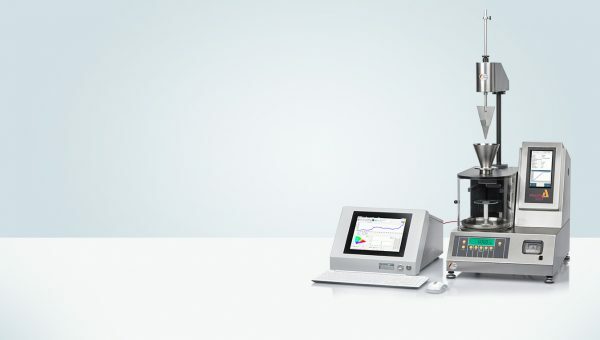 The PTG-S4 automated powder flow analyzer is used to measure the flow behavior of granules and powders in compliance with the EP <2.9.36>, USP <1174> Pharmacopoeia and ISO 4324 standards. 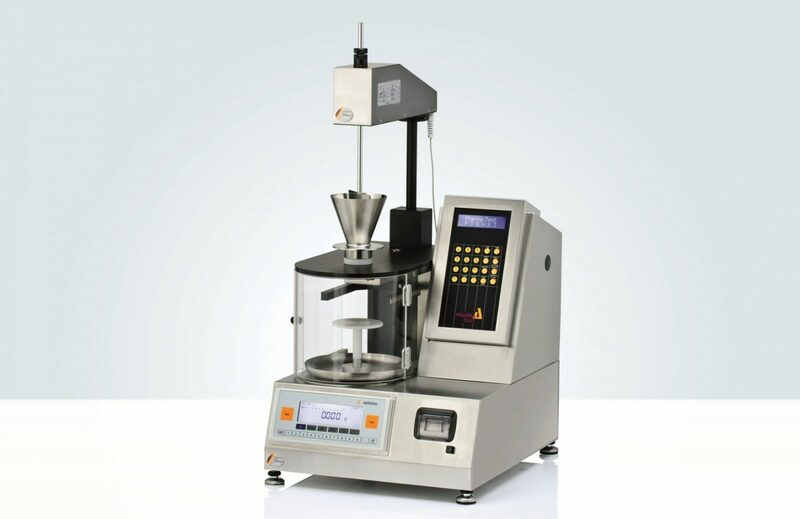 This instrument determines the powder flow time, the powder cone angle of the collected powder mound, the weight, the density and the volume of the powder cone. Furthermore the EP “flowability” result is calculated by measuring the flow time of 100g of sample through a specified pouring nozzle. 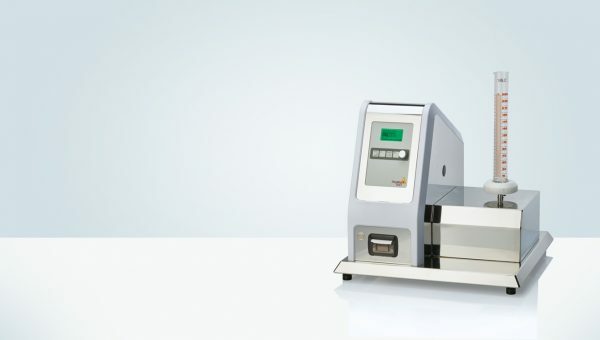 The PTG-S4 is equipped with a clear view dust hood, made from anti-static material, to protect the user from most of the dust during the powder analysis. 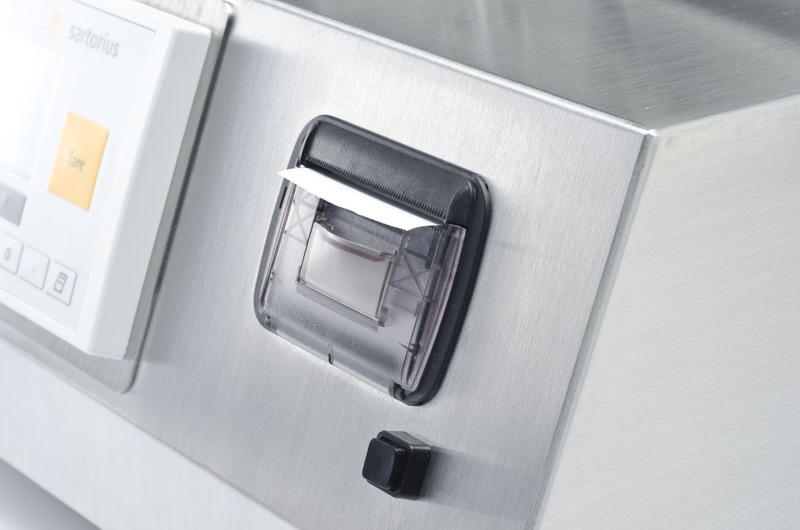 This hood can easily be opened and removed completely for cleaning. It has been estimated that over 50% of the materials used in all industrial applications were at some stage in a powder form. These powders need to be transported, injected, propelled and be able to pass through various process stages before they achieve their final form. This final form may be a tablet, a suspension or indeed a powder formulation. The need to be able to measure, control or test for reproducible powder flow has been well established in many industrial applications. In processes, which rely on powder and / or powder, mix integrity, the need to have the correct powder flow characteristics is paramount. These powder mixes have to be formulated, mixed and certainly transported. Transportation, even over small distances an easily lead to classification of sorts such that “fines” may drop out and alter the particle size distribution and hence the flow characteristics. 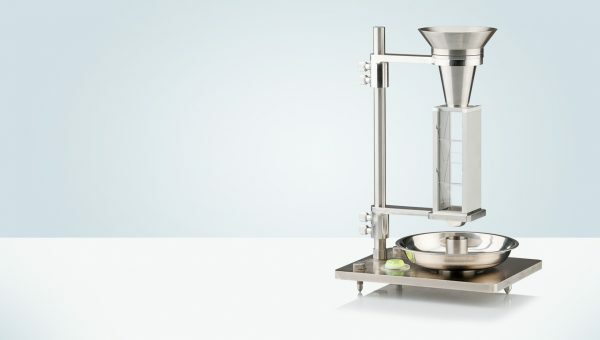 For example we can look at formulated mixtures, which are fed into tableting machines: these powders need to flow in exactly the same way from batch to batch. Generally, the active ingredients are materials that have no natural flow properties. They are sticky (cohesive) and prone to agglomeration. 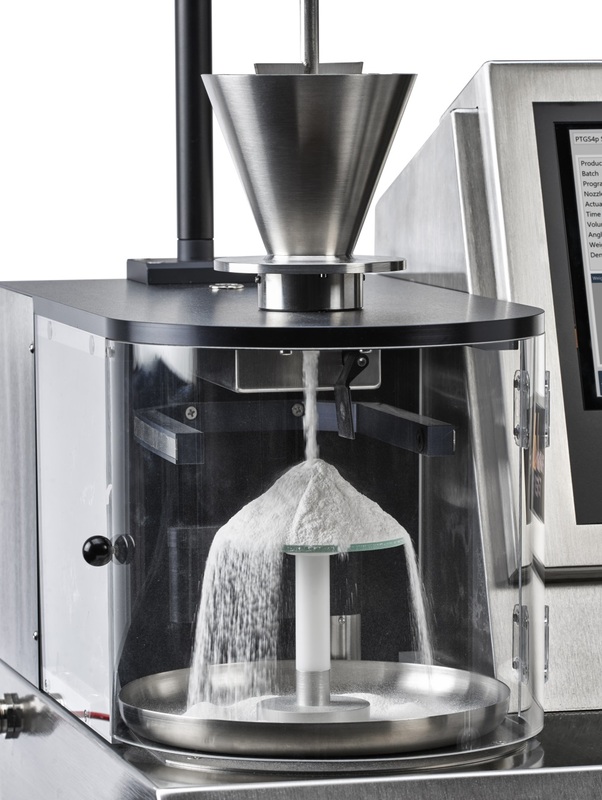 Additionally, the requirement of active material in ever decreasing dosages means that the active must be able to be dispersed in a non-active medium (normally made up of well-established and mainly natural products) in a reproducible way in the mixers prior to the introduction of the formulation into the tablet press. The PTG-S4 is widely used to compare batches of powders perhaps supplied by the same manufacturer over a period of time or for similar materials provides by different suppliers. The flow characteristics can be easily and quickly determined as a QC tool for inter- batch reproducibility, as this may have a distinct bearing on the ease of production especially if powders are capable of agglomeration and cohesion over time. The design is compliant to the ISO 4324 (12/83) standard, EP <2.9.36>, and USP <1174>. 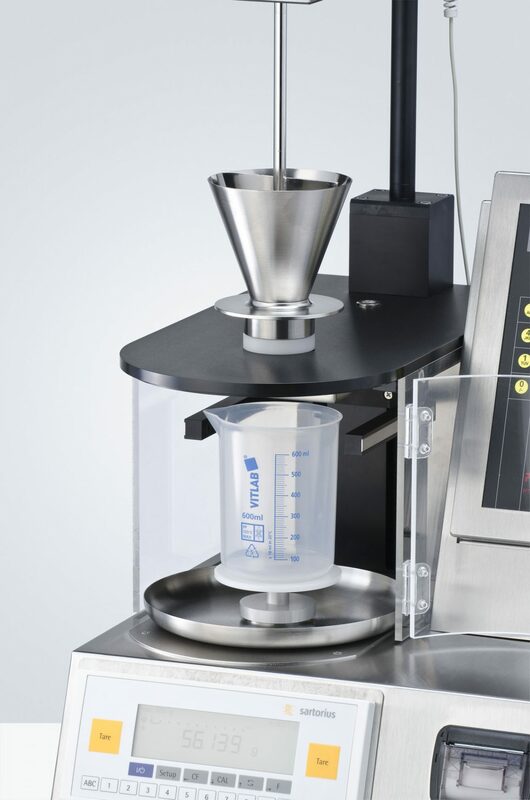 A conical funnel, which can be equipped with different pouring nozzles, takes the sample to be tested. 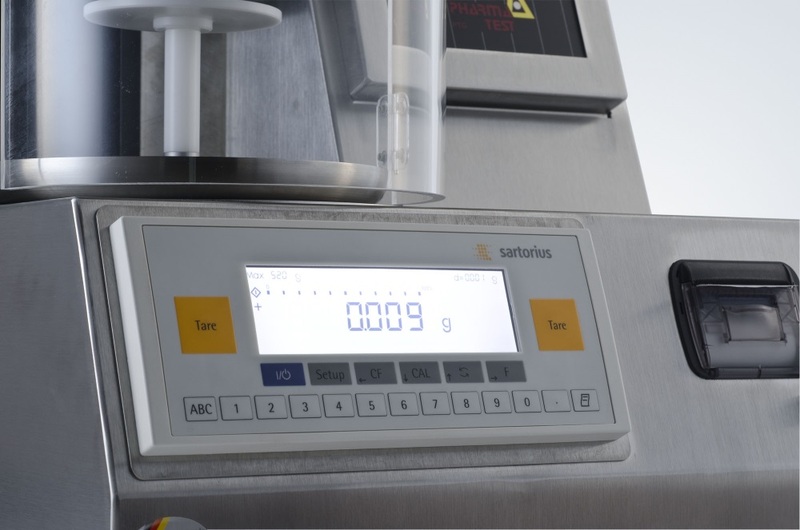 A built-in analytical Sartorius balance cell takes the product collecting dish. The PTG-ER electrical stirrer may be used for powders, which do not flow well. Most pharmaceutical material contains such a high amount of fine particles that it will not start to flow without assistance. The test should be repeated (in accordance to the ISO 4324 five times) and the deviation of results should not exceed 5%. The test results are displayed at the LCD display of the PTG-S4. Using the built-in thermal printer a test report and powder flow-chart will be printed including descriptive information of the product. 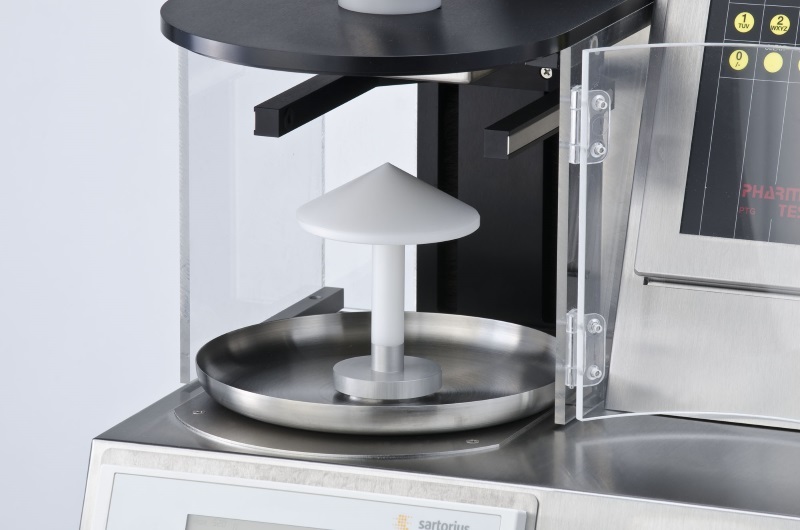 The PTG-S4 powder testing system includes a built-in analytical Sartorius balance cell, which extends the instrument use to test powder flowability, density and volume. Additionally, a graph can be plotted on the built-in printer showing the flow behavior of the sample under test. 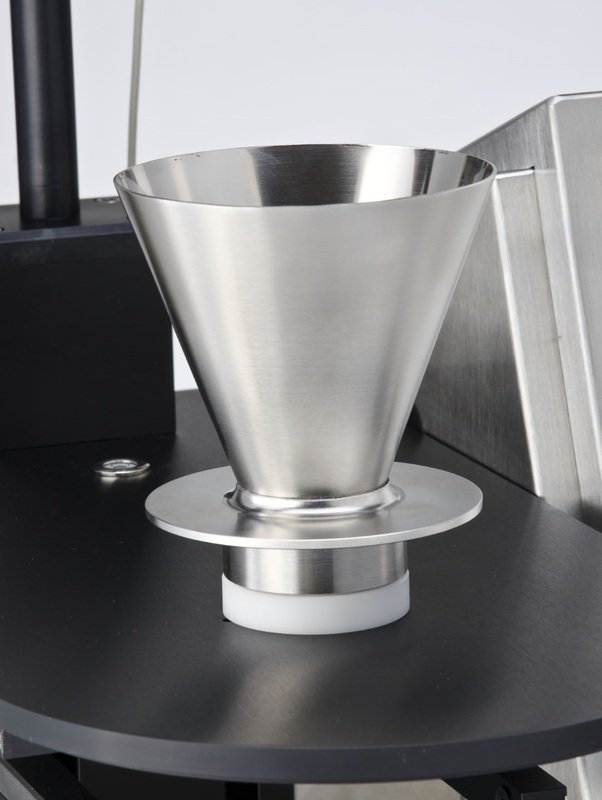 Using the conical stainless steel funnel as described in the current EP/USP monograph and use the changeable nozzles of 10, 15 and 25mm, the cone angle can also be tested. If smaller diameter nozzles are to be used, an adapter ring which allows the use of pouring nozzles from 4 to 10mm is available. Up to 10 tests can be performed and used to calculate statistics including mean values of all selected test parameters. The data and results are displayed on the LC-display, presented as hard copy on the built-in printer or transmitted via RS-232 interface to any external data collection system. For smaller volumes a 10ml funnel and a smaller sample collecting dish are available. This optional accessory can be used with pouring nozzles from 4 to 10mm diameter. A suitable stirring shaft completes the set.